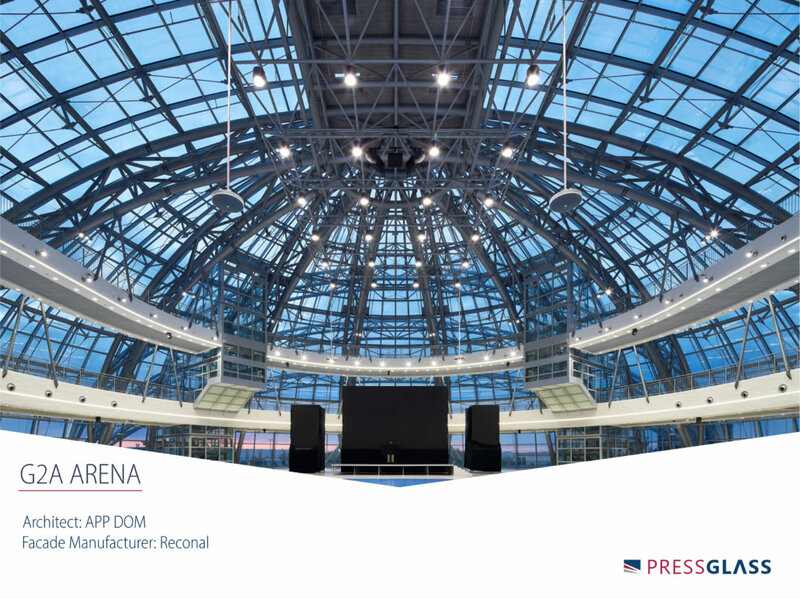 G2A Arena in Jasionka near Rzeszów (Poland) is the largest congress and exhibition facility in the Podkarpackie region. To complete external glazing including facade glazing, skylight and glass dome PRESS GLASS supplied over 8 thousand m2 of glazed units with selective glass of 70/37 type. RECONAL was the main contractor completing the external facades. G2A Arena is a multifunctional and modern facility, in a location easy to reach by any means of transport. Its futuristic design was developed by APP DOM design studio. The complex consists of two linked non-uniform structures with the total area of 28 thousand m2. The functionalities of the centre are divided between two visually distinct structures: a reversed cone (congress centre) and ground dome (intended for fair organizing). It is a great advantage of the centre – the buildings are autonomous and independent but can be used as a coherent whole. The architectural shape of the congress building resembles a glazed stadium built on a circular concept. The shape is similar to a reversed and cut cone. 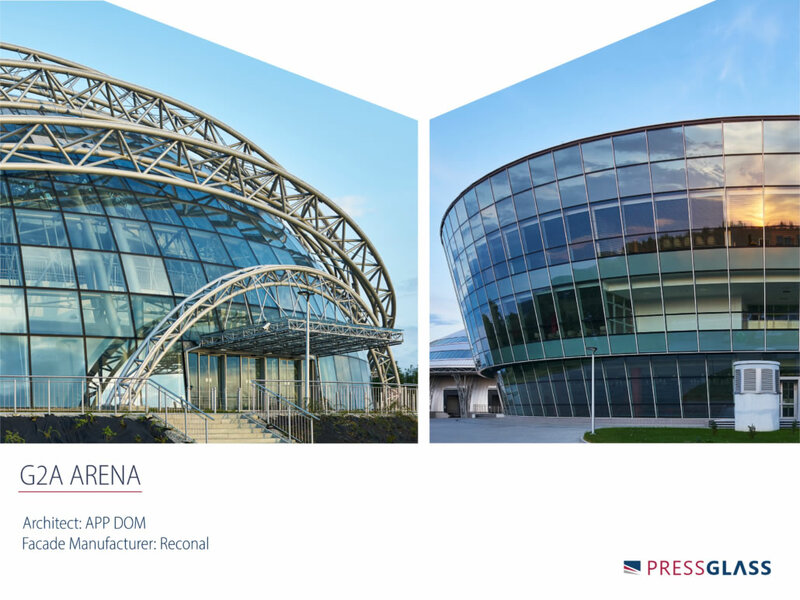 PRESS GLASS delivered 2.2 thousand m2 of facade glazing with toughened and laminated glass of high selectivity, type 70/37 and 1.4 thousand m2 of glazed units with nontransparent enamelled glass for the façade glazing. A skylight in a shape of glass dome provides an additional source of natural light. 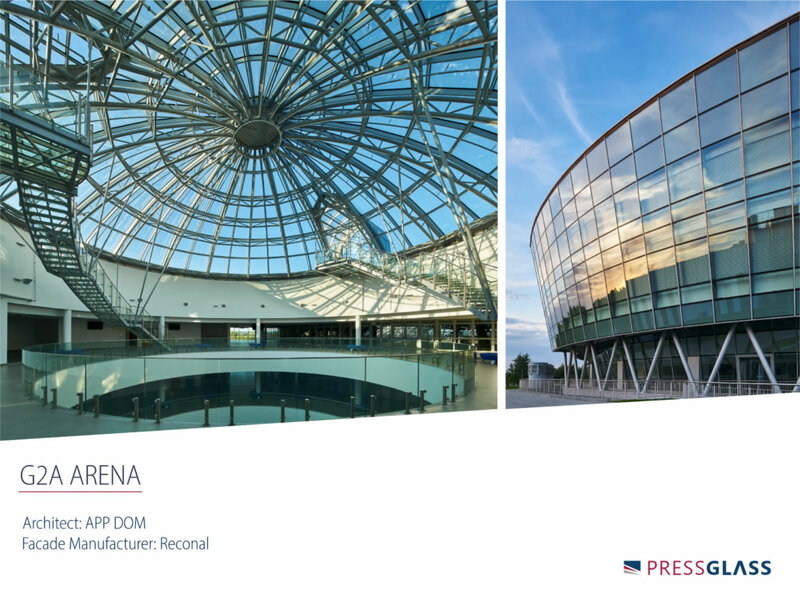 Over 0.8 thousand m2 of our glazed units were used to complete the dome. The congress building has three storeys on the ground and a basement with an underground garage. The building features the largest auditorium in the Podkarpackie region able to hold almost 900 people. Furthermore, there are two conference and banquet rooms and office spaces inside the venue. The other building in the G2A Arena complex is a single-storey open exhibition space. It offers exhibition premises with the area of 4.8 thousand m2 with two additional mezzanines - 1.2 thousand m2 area each - with complete office facilities. The shape of the building is a futuristic variation on modern architecture. It is a partly glazed, two-step ground dome on an elliptical plane with a diversified height. The construction of the dome is based on steel arches made of tubular profiles brought together to form a connection between two parts of the dome. Truss purlins were used to stabilise the dome and to support the covering elements. Almost 3 thousand m2 of toughened and laminated glazed units were used for the whole glazing of the lower part of the dome. 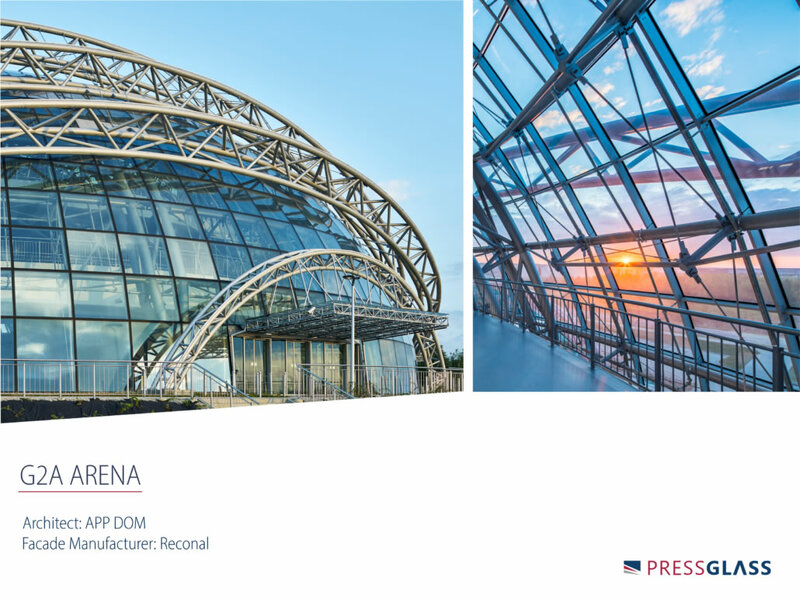 The glass manufactured by PRESS GLASS was also applied for glazing of the vertical connection between the domes and additional lighting of the upper part of the dome where office rooms are situated. Jacek Sikora, Sales Director, in charge of the Project on the PRESS GLASS side, emphasises that the choice of selective glass of 70/37 type was not incidental. "A large quantity of external glazing means a challenge related to thermal comfort when the building is used, especially when it is exposed to strong light and heat. We supplied solar control glass for the building to ensure sensible management of the quantity of solar energy while maintaining high transmission of light", says Jacek Sikora. Roman Lemanowicz, RECONAL Works Manager, points out that it was among the most difficult implementations he has been coordinating. Glazing of two structures with non-uniform constructions required high accuracy and different installation strategies. "For the glass installation on the dome we used mesh scaffoldings and individual packets were placed in the seats on pads using suction pads. This way of installation was determined by other works carried out simultaneously with the dome. The case of installing glass panes deviating from the vertical plane on the cone was different - façade glass panes were pulled into the building from a platform, which required partial disassembly of the scaffoldings", explains Roman Lemanowicz. RECONAL had to do some extra works within the Project that had not been planned in the original schedule of works. "The aluminium construction and glass intended for glass facades were prepared according to the specifications of the construction detailed design, in which the supporting steel construction of the dome was made and delivered to the site with holders fixing the posts of the aluminium façade construction. It was very important that the holders were located exactly at the specified heights to ensure correct installation of the aluminium construction, installation of glass filling and consequently to ensure the right parameters of the façade during its use. When the facade shell was being installed it turned out that there were differences between the design and the actual location of the holders. Fortunately, we managed to eliminate the differences owing to regular cooperation with land surveyors. Finally, keeping the accuracy and facade tightness as our priority, we installed all elements according to the design concept", explains Roman Lemanowicz. It is interesting to know that almost all glass panes supplied by PRESS GLASS had a trapezoid shape. The designers selected the elements to represent spherical and cylindrical shapes of the designed structure of the complex. The trapezoid glass panes varied for their shape on each level of the dome. "It required great accuracy both at the stage of production and deliveries", Jacek Sikora adds. Besides the additional requirement related to the individual shape of the glass sizes, the glass panes were processed in several steps. If processing had been performed in dispersed locations, it could have led to unreliable deliveries. "Owing to the fact that we are able to complete all production processes in one plant, we successfully eliminated the risk", informs Rafał Wrona, Special Glass Production Director in PRESS GLASS. The glass shapes were delivered strictly according to the established order and in specified batches. 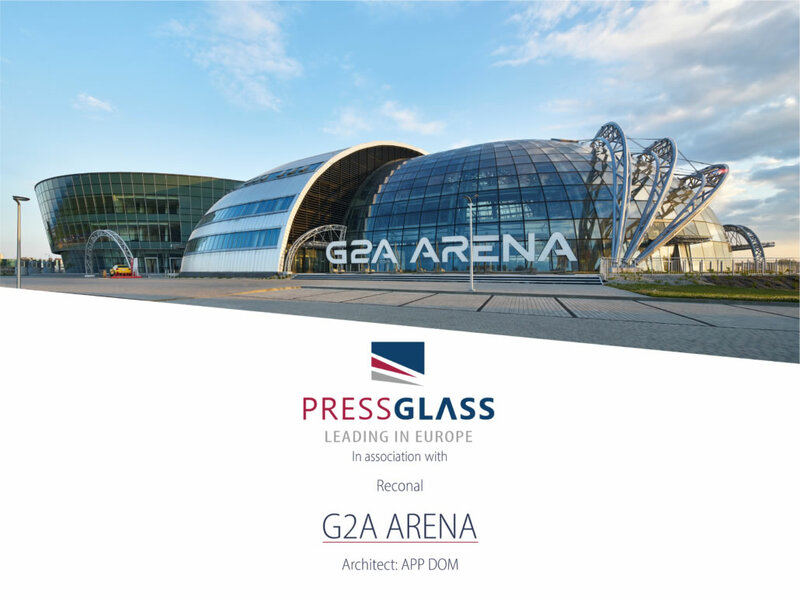 "It was aimed at synchronising deliveries to the site with the order and dates of installing the glazing in different parts of the building", points out Zdzisław Warzycha, PRESS GLASS Transport Manager. A total of 8.2 thousand m2 of toughened and laminated trapezoid glazed units were used in the investment and 21 thousand metres of aluminium profiles were processed to make the architects' vision come true. The facility was formally opened on 23 June 2016.